Dr David Curnow Why does toothpaste make orange juice bitter? What is the difference between adult and child toothpaste? Why does tooth paste make orange juice bitter? Check this video out! 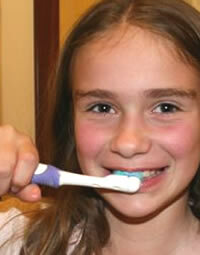 Children's toothpaste with low dose fluoride is not effective in protecting from tooth decay according to a recent paper. Children at high risk of tooth decay would be be better off to risk fluorosis than the pain and hazards of decay - according to health experts. The review paper looked at the results of 79 clinical studies which reviewed 73,000 children and found the benefits of fluoride are reduced with low fluoride toothpastes. The review was published within the Cochrane library. Children under the age of 6 years traditionally have been encouraged to use a child low dose fluoride toothpaste because of the risk that children will swallow the majority of the toothpaste. Fluorosis is a condition where teeth enamel takes on a mottled white or brown patchy appearance. This is permanent and only occurs when teeth are affect while the enamel is forming within the bone (before the tooth has erupted or grown into the mouth).